Great Labor Day weekend with friends and family in Albuquerque, New Mexico. Inspired by the landscape and hiking in the Sandia Mountains. Thinking about “machines of loving grace,” I sketched up a couple of techno-eco ideas, and here’s one (below). 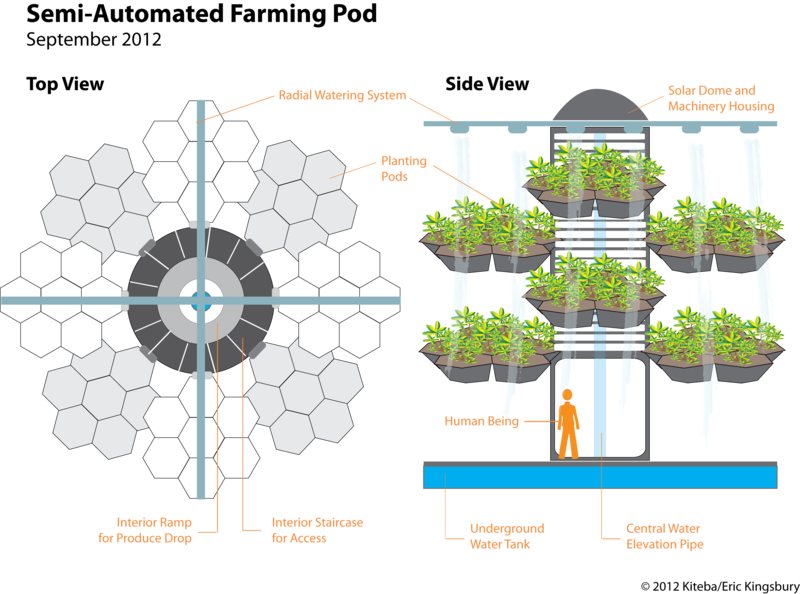 It’s an automated farming machine that uses suspended, interchangeable hexagonal pots, put into hexagonal pods of seven. These pods are suspended around a column, and a computer automates the watering and other processes. It’s solar-powered and reclaims some of its water. At harvest time, just lower the pods and pick, or access the produce from the interior and drop it down an internal ramp. Actually, it would be preferable if the machine did everything, but we’ll have to get to that. Lots of technical details to work out on this idea, but it’s an idea, a sketch. And good things start there.